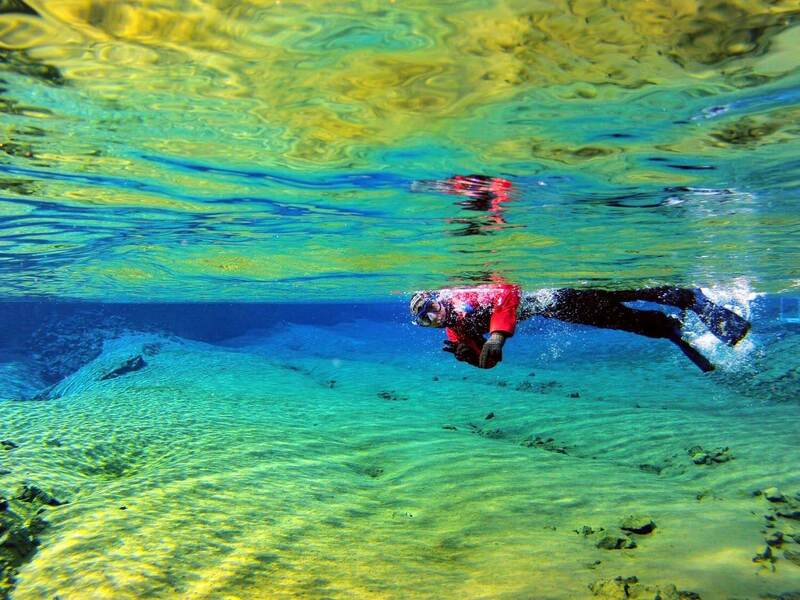 The Golden Circle and Silfra Snorkeling Tour offers a full day of fun in Iceland! The Silfra fissure is a natural wonder in Iceland, filled with crystal clear water. On most days you can expect visibility of over 100 meters. On this tour, you’ll not only snorkel in the stunning Silfra fissure but also enjoy visiting all the highlights of the Golden Circle. Visit sights such as Þingvellir National Park, Geysir and Gullfoss waterfall. On this tour you can choose between snorkeling in a drysuit or a wetsuit. During the Snorkeling tour your guide will take pictures that you can download free of charge after the tour. After pickup in Reykjavík, your first destination of the day is the Silfra fissure. 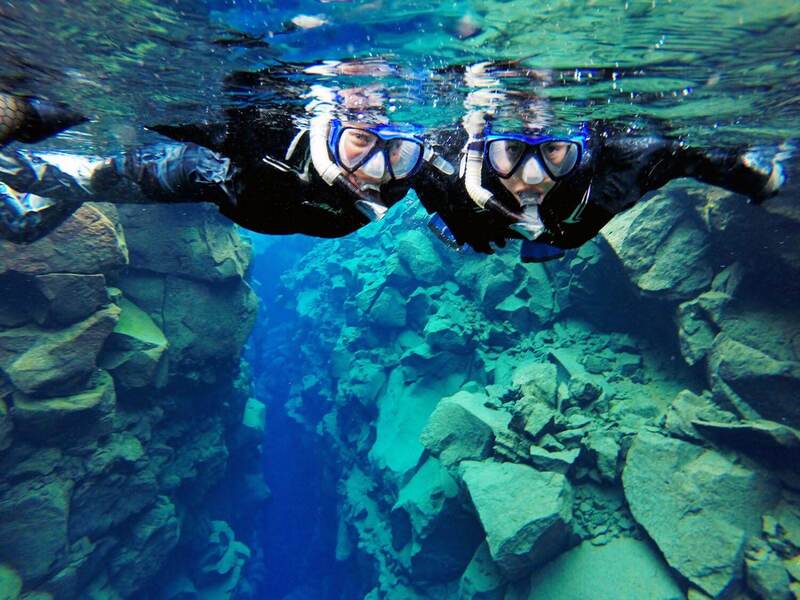 Known as one of the top dive sites in the world, Silfra is a truly unique natural phenomenon. 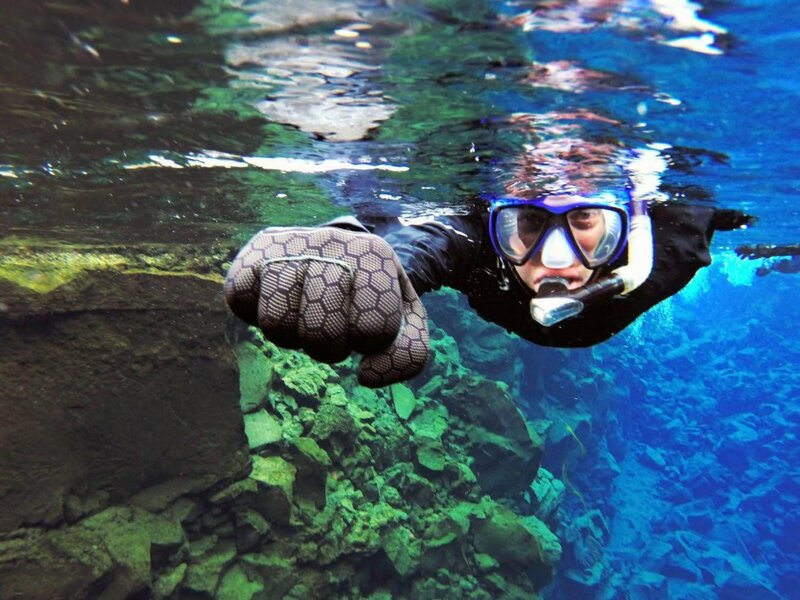 Here you will snorkel between the North American and Eurasian tectonic plates in crystal clear water. For the tour, you can choose between a dry suit and a wetsuit. If you choose a wetsuit, it might get a bit chilly but you will also be able to dive beneath the surface. The water temperature of Silfra is about 2°C year round, but if you aren’t afraid of the cold you will be rewarded with an even more special experience. After the snorkeling tour, it’s time to hit the Golden Circle! This route is home to some of Iceland’s most famous sights. You will start with a stop at Þingvellir National Park. A UNESCO Heritage Site, this national park caters both to nature lovers and history buffs. Here you can see how the North American and Eurasian Tectonic plates are diverging above ground. Þingvellir is also of great historical significance to Icelanders and in the park, you can learn more about the historical events that have taken place here. Next, it’s time to visit the Geysir hot spring area. Although the famous Geysir does not erupt frequently anymore, it’s little brother Strokkur puts on a fascinating show every few minutes. Be sure to have your camera ready for a picture perfect moment! After visiting Geysir you’ll continue on to the Gullfoss waterfall. This beautiful waterfall should be on the bucket list for anyone visiting Iceland! After a full day on the Golden Circle, you will be returned to Reykjavík in the late afternoon. You do not need to be an experienced snorkeler to enjoy the Silfra snorkeling tour, but you do need to meet some minimum requirements. Please read the FAQ section for this tour carefully before booking your tour. This tour is operated by one of our trusted partners. What are the specific requirements for this tour? Participants must have read, signed and followed directions on the Diving Silfra Medical Statement. Please bring a signed copy to your snorkeling tour. What is the height/weight limit for this tour? Why is there a limit? These limits are due to the standard sizes of dry suites used on the snorkeling tour. All guest must wear a dry suit when snorkeling in Silfra. Unfortunately, we can not accommodate guests who fall outside of these limits. For the snorkeling tour you should wear thermal underlayers long underwear) and warm socks underneath the dry suit. If you wear glasses, you should bring contact lenses. Will we stay dry in the water during the snorkeling tour? If you choose a dry suit, the general idea is that the dry suit should keep your body dry. Please note that there is always a small risk water can get into the dry suit. This is not in any way dangerous, but you could feel the cold a little bit. Please note that your hands and face will get wet. If you choose a wetsuit, you will get wet! How much time do we spend in the water during the snorkeling? The snorkeling itself takes about 30-40 minutes. When we get to the exit point which is in the Lagoon, you get the opportunity to swim around a bit longer if you’d like to. Do I need to know how to swim to be able to participate in the snorkeling? You do have to be able to swim to participate in the snorkeling. Photos are not included in this tour but you can choose to rent a GoPro camera at booking. If you rent a GoPro camera you will get an SD card with your pictures after the tour. No, lunch is not included on the tour but you can purchase lunch and snacks on the way. You are also welcome to bring a packed lunch. How many guests are on this tour? The minimum number of guests on this tour is 2. The maximum number of guests per guide is 8. Yes, we offer private tours. Please note that we can never guarantee that you will be alone in Silfra, but on a private tour you will have your own guide which creates a more private experience. A private tour is a great option for families, groups of friends and even couples who are looking for a special experience. If you’d like to book a private tour, please email us at info@iat.is for availability and pricing. What is the cancellation policy for this tour? Reservations can be canceled 48 hours prior to departure without penalty. Cancellations received less than 48 hours prior to departure are non-refundable. Cancellations must be submitted in writing to info@iat.is. Please be mindful of possible time zone differences. Iceland is in the GMT time zone and cancellations must be submitted at least 48 hours before departure in Icelandic local time (GMT). If you do need to cancel your tour, we recommend that you contact us as soon as possible. Price from 28.900 ISK per person.